Had you seen these photos?? - Still here! Had you seen these photos?? 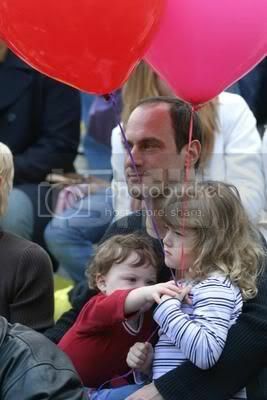 debaser28 sent me a link to photos of Chris and his two kids - did you understand, people? These are the first Dante photos I saw!!! debaser28 said those photos were taken during last Thanksgiving Parade. They were found at www.isifa.com, and there were photos I'd never seen before. That is Tony Shaloub. And Jonathan Silverman. And the chick that was killed off "Crossing Jordan." Must have been some sort of celebrity bleacher seating. 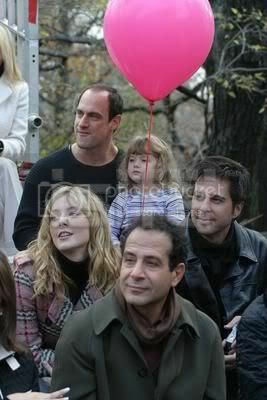 Thanks Meloni for going there with his kids, or probably we'd have to wait much more to know Dante's chubby face! Awww, cute. :) I haven't seen any photos of Dante before either. Cute little boy, isn't he? I like the determination in Dante's eyes, "My balloon. gimme, gimme." 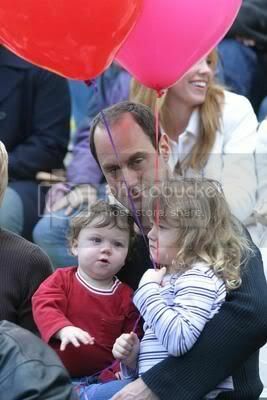 Yeah, Daddy, don't let her keep all ballons!! Awww! *snugs those babies* So cute. Thanks for sharing! Chubby faces and all - one can't resist them!! I can see that his kids are cute and all—but honestly? Here's what I can't stop gawking at: CHRIS—specifically, how HOT he is in that black sweater and his *neck* in that third picture.